Ted Farr's love of cars began pretty much at birth. It was a family thing. At the age of 3, Ted could identify any car on the road. One of his uncles owned a Dodge dealership in Brantford Ontario and later a used car lot with the slogan, "Buy Farr the Best". Another uncle in Brantford was a dealer/collector of antique and classic cars for more than 50 years. Ted went looking for a Mustang convertible in the late ‘80’s. His uncle helped him find a couple of restored examples of the early GT, but the price tag was too high for a young family budget. Ted had owned a 1970 Cougar back in the day and loved it. When he found another one in 1988, he wrote the cheque. The 1970 “Houndstooth” Cougar XR7 is still in his garage more than 25 years later. Ted and his wife Terrie moved to the Kelowna area in the spring of 2009. He had decided to end his 40 + years in day to day radio and become a media and marketing consultant working from a home office. In 2013, Terrie uttered these now family famous words; if not now, you’ll likely never do it. She was right! If Ted didn’t find a Mustang convertible and soon, he’d probably never own one. Ted’s priorities changed after beating cancer. He had owned two convertibles back in the '60’s. They were both British sports cars. His first was a red, 1962 Austin Healey Sprite. The second was a brand new, dark blue, 1969 MGB. He loved the 1999 - 2004 body style or fourth generation Mustang. He also knew the price tag on a '65 or '66 GT convertible would be out of the question. Yes, it had to be a GT and, it had to have a standard transmission. The first Google search produced a car and at a price well within budget. It was a trade-in at Metro Ford in Port Coquitlam BC. A week later, it was on its way to Kelowna. It was meant to be. So here’s the breakdown. 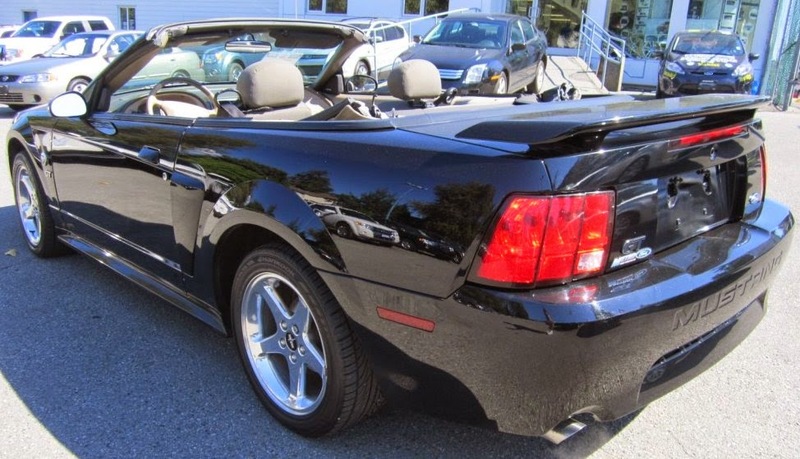 It’s a 2004, 40th Anniversary Mustang GT convertible, low miles, 5 speed. Under the hood is the muscle of the 4.6 liter V8. The GT has sport suspension, stainless steel exhaust, air conditioning for those Okanagan summer days when it’s just too hot to have the top down, a great stereo with a 6 CD changer to blast music from the 60’s and 70’s, and 17 inch aluminum wheels with low profile boy racer type tires. Ted has added a cold air return to the engine, new floor and trunk mats with the GT logo and being a non-smoker, he found an aluminum plug with the GT logo to replace the cigarette lighter. While driving through Summerland BC in the summer of 2013, the wind caught Ted’s convertible boot and blew it right off the car. He and a friend searched for days but never found it. They even flew a camera equipped drone over the area, taking nearly 500 pictures, but still nothing. Ted never did like the design or fit of the factory boot. While searching for alternatives on line, he discovered that Ford had offered an optional tonneau cover back in ’04. It attaches with snaps inside the trunk frame to prevent theft and provide a clean look. 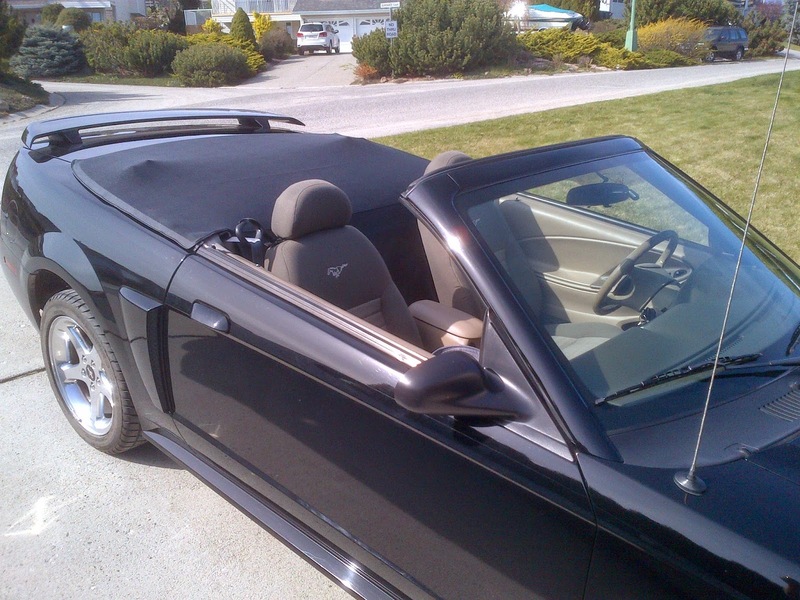 It covers up the back seat for better aerodynamics with top down on the highway. Ted found one still in stock at a Ford dealership in Oregon. They sold it to him for half price. Doesn't get any better than that. "If I had more money and a bigger garage, I'd be dangerous"
For Ted Farr, owning cool cars is just fun. His dream collector car would be an original, 1960's, Ford GT40.